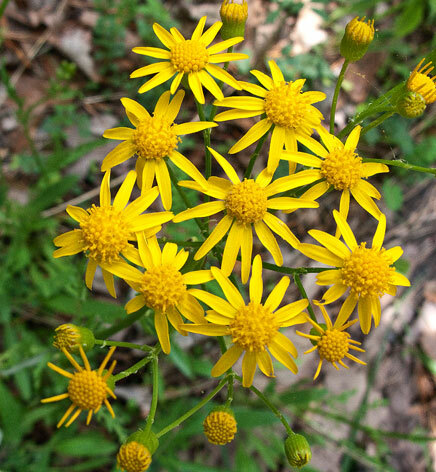 This perennial wildflower consists of a small rosette of basal leaves spanning 2-4" across, from which there develops a single stalk of flowerheads about 6-14" tall. The basal leaves are 1½-3" long and ½-¾". Along this stalk, there are 2-4 alternate leaves; they are up to 2½" long and ½" across, becoming smaller as they ascend the stalk. 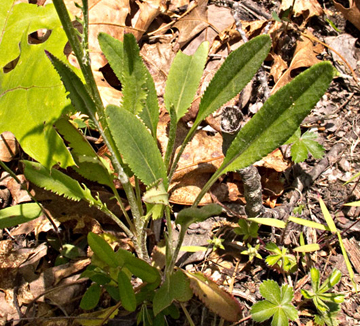 The alternate leaves are narrowly lanceolate-oblong, pinnatifid with cleft lobes, and/or coarsely dentate along their margins. The central stalk terminates in a flat-headed panicle of 5-30 flowerheads. Each daisy-like flowerhead spans about ½-¾" across, consisting of 40 or more disk florets and 8-13 ray florets (rarely none); the disk and ray florets are both perfect and fertile. The corollas of the disk florets are deep golden yellow, cylindrical in shape, and 5-lobed.